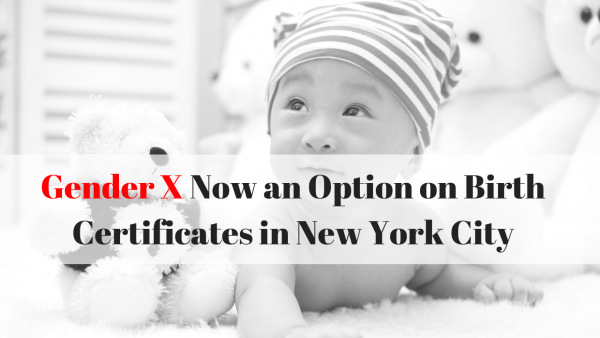 Starting January 1, 2019, New York City will update the gender label on a birth certificate to male, female, or X upon self-attestation by the applicant of their gender. The applicant will be able to do so without a doctor's note or medical assessment. Now parents can choose "X" for their children, and adults can select the marker for themselves as long as they attest the change is "not for any fraudulent purpose," the form states. New York City Mayor Bill de Blasio signed the measure into law on Tuesday, marking a breakthrough in a years-long struggle for advocates. "To all trans and non-binary New Yorkers: We see you, hear you and respect you. Starting in 2019, all New Yorkers will be able to change their gender on their birth certificate to M, F or X — without a doctor's note," the mayor's office tweeted. More than one-third of transgender people describe themselves as non-binary, which the National Center for Transgender defines as "people whose gender is not exclusively male or female. This latest policy change allows residents to self-identify and obtain proper gender identification—without needing legal assistance and a court order. The move also validates the identities of transgender people, who are victim to harassment and violence at higher rates than those whose gender identity or expression matches the gender they were assigned at birth. Nearly one-third of transgender people said they were harassed, assaulted or denied service because their ID did not match their "gender presentation," according to the 2015 U.S. Transgender Survey from the National Center for Transgender Equality. New York City is joining California, Oregon, Washington state in allowing an undesignated gender option on birth certificates. A similar provision takes effect in New Jersey in February. Dads Can Change Diapers Too!